10” consumer tablets don’t seem to make much sense to me. I can’t think of any scenarios that need that much space apart from newspaper and magazine typesetting. Sure, a netbook running a multi-windowing OS could use a whole lot more space but when I look at Android tablets that show one window at a time through apps that were created for a maximum 5” screen I have a problem. Having said that, there’s a special feeling one gets when touching and moving huge web pages smoothly across such an area when the screen is only 50cm from your face. Video becomes more immersive too, especially when it’s good quality. The challenge is to create a large screen at a very low weight. A low price always helps too! 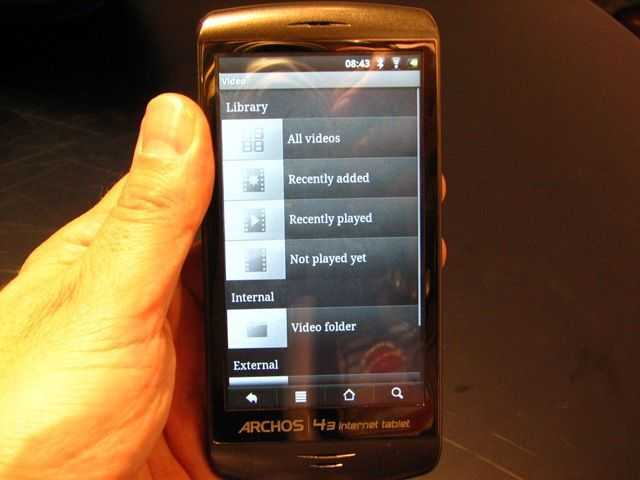 The Archos 101 [specifications and details] does 10” in 480gm. That’s an impressive size/weight ratio and when you add in a price of just $300 you have to agree that Archos have set out in the right direction with the 101. 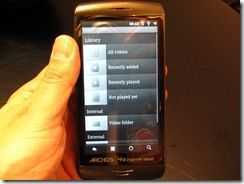 Its almost no surprise that the Archos 101 doesn’t include Google Applications but there’s a lot more to get excited about. A full range of codec support, USB host (with full-size USB port) and a good level of processing power. It looks good too which is important when you’re aiming for as many coffee tables as possible. Personally I still think that 7” makes more sense for a single-window experience but if you’re looking for an impressive gift for yourself, big is always better right? Full specifications are in the database, a Chippy hands-on is shown below and we hope to be testing this out further as soon as we can. Note that the test devices at IFA were all running Android 2.1 Android 2.2 will, without a doubt, speed this up to very acceptable levels. 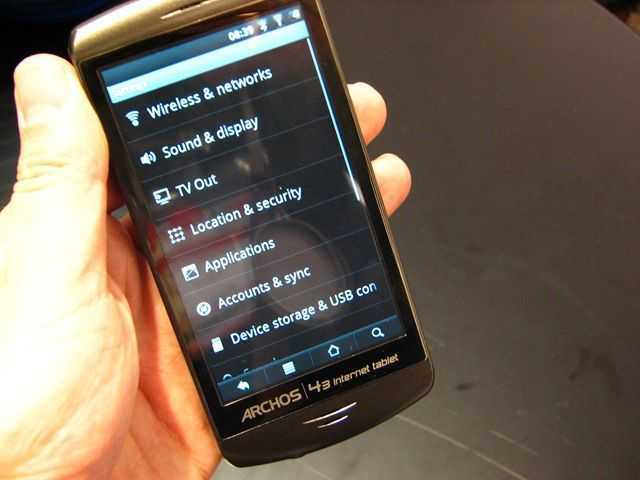 Archos 70 Combines Value with Some Good Features, Some Missing Features. 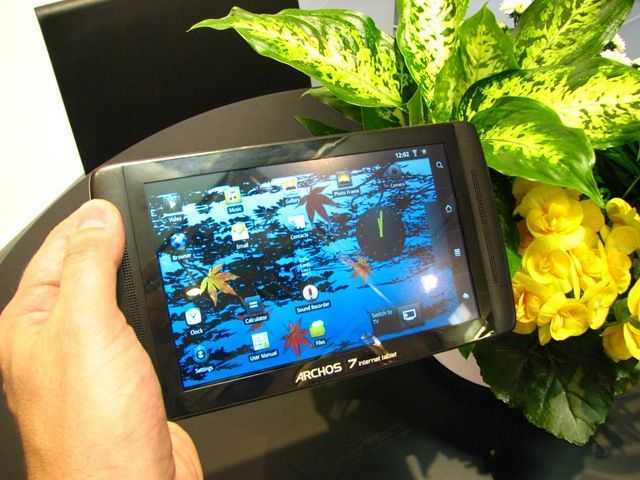 Most of you will have heard about the Archos 70, part of the new range of tablet devices being launched over the next few months. Archos have stripped away their recording software and docking station, bumped up the processor, improved the operating system and hit a very competitive pricing point. Add features like HDMI, USB host, capacitive multitouch, multiple video format support and you’ve almost got a full Android Tablet specification list. It’s not complete though. While 800×480 might be acceptable as a resolution, the lack of Google applications isn’t. No Gmail. No free Google Navigation, No Contacts sync and of course, no Google Market. 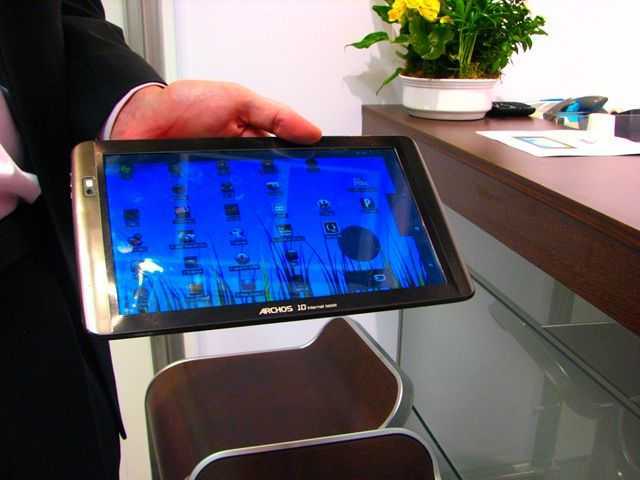 We’ve experienced it on the Archos 5 and it really is noticeable. 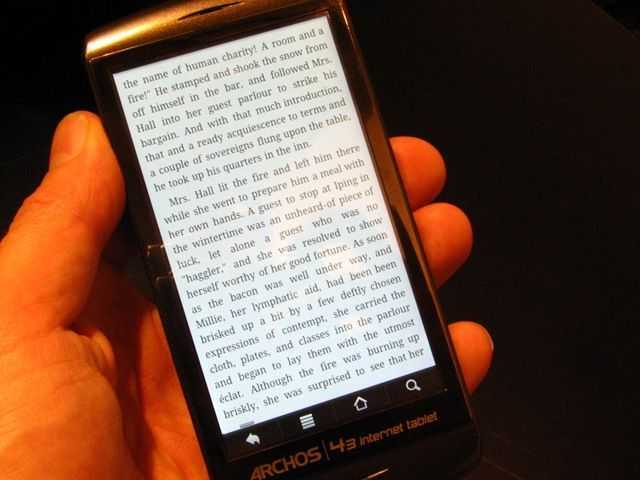 Having said that, if you consider the Archos 70 as a sofa tablet, car tablet, holiday tablet and bedside tablet, you’ve got a video and audio player that returns a great browsing experience and offers a stylish way to view photos and ebooks. 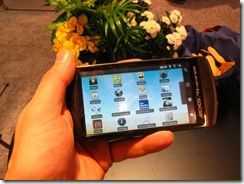 If you’ve got a way to ‘sideload’ some Android applications you’ll also benefit from some really great applications for entertainment and communications. Pricing is $275 and it’s coming in Sept or Oct. Note that it might ship with 2.1 but 2.2 will, apparently, follow-up very quickly. 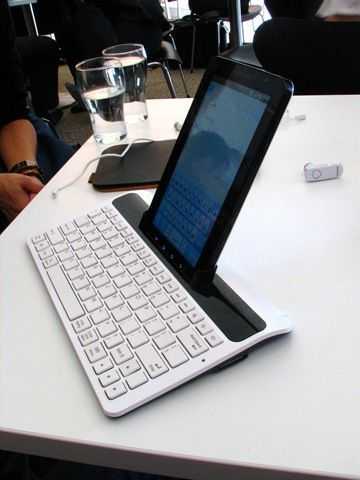 Not quite as far down the line as some of the other Android tablets we’ve seen at IFA is this, the Interpad from E-Noa. 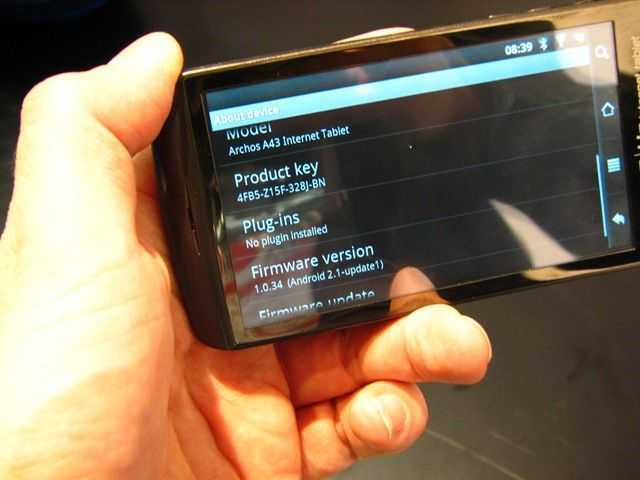 [specifications] It’s a 10” capacitive touch device based on a Tegra 2 platform and will launch without 3G, camera and Google applications towards the end of this year at 399 Euros. That’s not quite up to the Archos 101 offering on the tablet right now but with 1024MB of RAM and the Tegra 2 platform, this is certainly a good one for hackers to think about! Android 2.2 is promised. E-Noa will produce a ‘street’ version with the necessary specs for Google Market in early 2011. Price and full details unknown but we’re told it will have GPS and 3G. That would put it in the 450-500 Euro space. Full gallery here or click on any of the images below for larger versions. In our meeting with Samsung today they came clean about pricing. We also heard about the CPU, some Samsung Market information and got a look at the accessory pack. Pricing is indeed 799 Euro. This is, however, ‘u.v.p’ which is the same as ‘recommended retail price.’ What this means is that Samsung have built in a big pricing buffer that their customers (the carriers and resellers) can play with. We’re expecting street prices to be way lower than this and we saw a few nods when we mentioned 500 Euros. I get the impression we’re going to see early pricing hit 700 immediately and then a decline to the 600 mark over the next 3 months. Yes, the Galaxy Tab is expensive, but not as expensive as we first thought. Note: German pricing includes 19% tax. 670 Euros is the pre-tax price. If we’re lucky, Viewsonic will get that truly comparable, although not as sweet, Viewpad 7 out for 399 Euro and make Samsung think twice! 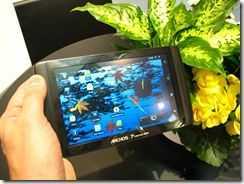 400 certainly seems the right price point for a full 3G, GPS, compass, capacitive touch equipped consumer Android tablet. Note about the O2 price mentioned in the video (via Twitter) – beware, it could be a contract for the hardware only. O2 Germany usually offer all their mobile devices in separate hardware / call / data contracts. 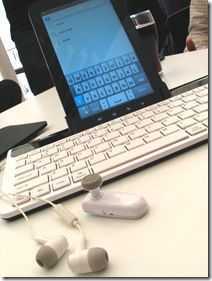 That would bring the cost of the device to 759 Euros – not the cheap deal it might seem. On the Samsung Market: It sits alongside the Google Market and offers developers a channel for Galaxy specific apps to be built for the device. Samsung will launch a promo campaign for this shortly. This was a prototype. Pricing not known but we’re guessing it will be well over 50 Euros. Chatting to people around IFA today we’re all agreeing that the Viewsonic Viewpad is another ‘complete’ Android Tablet product. Apart from the latest Ghz-class CPU, and lets not forget that a 600Mhz Cortex A8-class CPU isn’t actually that bad, it has everything needed for the full Android experience. From camera to 3G. From GPS to Market. From capacative touch to good build quality. You can even use this for voice calls. The price is 399 Euro (maximum) which we think is very competitive indeed. In the video below we go over the device and run a few tests, including the voice call! Correction: IN the video I talked about a 1024×600 screen. We’re checking this. At the moment the general opinion is that it’s an 800×480 screen. That does make some difference for web browsing it will be difficult to detect any downside when using it in apps that are all designed for smaller resolutions anyway. 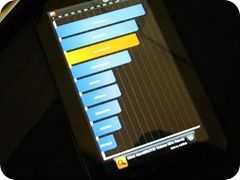 Viewsonic Viewpad 7 – Shaping up Nicely. Pics, Thoughts. In summary, the Viewsonic Viewpad 7 is delivering most of what the Galaxy Tab is delivering, for an excellent price. You haven’t quite got the build quality (it’s good though) and you’ve got a known brand, Android 2.2, capacitive touch (good screen quality), 3G, voice and the Google apps. The only thing you might notice is the user interface. It’s not as swift as the Galaxy Tab and that’s clearly because the CPU is a Snapdragon at 600Mhz and not the high-end A8 Cortex device of the Samsung. It’s not bad though and in my tests over 3G I was happy. Watch out for more later. 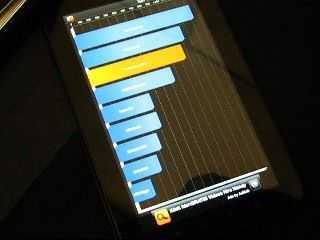 I’ve got two videos of the Viewsonic Viewpad 7 and I’ll also be checking out the Viewpad 10, an X86 device. We didn’t get a huge chance for hands-on as we stumbled across the Toshiba press event at IFA today and with the device locked to the wall, without and sort of Internet connection and without any supporting technical staff, it was difficult to do a good test on the Toshiba Folio 100. 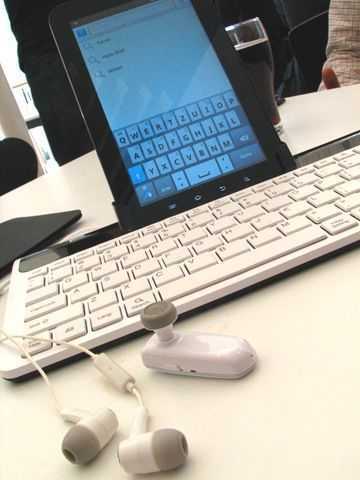 We want to go back and ask about pricing, Google apps and Android 2.2 availability for the keyboarded version that we’re doing extended testing on, the AC100. I’ve published a video on YouTube (below) that might give you a few snippets of information about the Folio but we’ll be back over the next few days with more information. We promise! We’ve managed to get some time with the Galaxy Tab at IFA and we’ve got pics, a video and some benchmarks following in the next post. It’s quite the looker, performer and a very good all-round tablet package. Fist impressions: Slick, fast, great weight/size ratio and Samsung have managed to include the Google applications AND their own app creations. The screen is sharp and, as expected actually, great quality with a contrast, brightness and ‘pop’ that we grew fond of with the Samsung Q1 Ultra UMPC. Web sites loaded quickly and cleanly over 3G and capacative touch was smooth. Stereo speakers are loud and of good quality for the size. Another trick that Samsung performed on the Q1 Ultra! 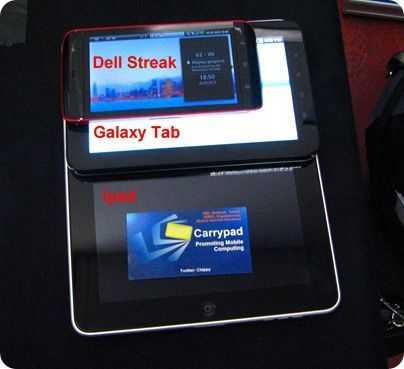 We got an iPad and Dell Streak in for size comparisons and as you can see, it’s less than half the size of the iPad. As for iPad and Dell Streak comparisons, I’m going to spend a few days thinking about it before I put any thoughts forward. We’ll get some more hands-on over the next few days and test out the Samsung apps and some applications from the Market. Stay tuned.